It’s the original Chewbacca action figure. I have mine somewhere. But I don’t think he’s wearing a snazzy santa hat. 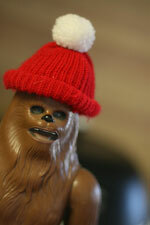 i think i saw one of the chewys wearing a hat like this in Star Wars episode 3.